At IDRSolutions we provide a web-service that converts PDF documents to HTML5 and we recently toyed with the idea of adding a GUI to our web service. In this tutorial I will be showing you how we went about tying our webservice to a JavaFX front-end. An IDE capable of supporting web-services, we recommend NetBeans IDE 8.0. A basic understanding of JavaFX. A free web-service account from here. Firstly, to be able to tie a GUI to our webservice we first need…. a webservice! We will be creating ours in the NetBeans IDE, so lets get started. 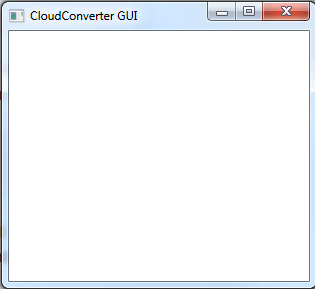 Where it says “Create Application Class”, change it from CloudConverter to CloudGUI. Now in the left-side Projects tab, expand CloudConverter project > expand Source Packages > expand cloudconverter package. 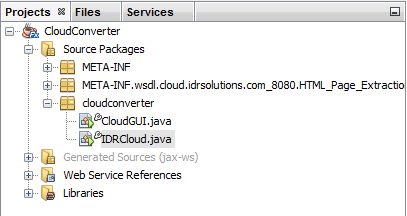 Right click cloudconverter package and select New > Web Service Client. Right click the cloudconverter package again and goto New > Java Class. Give it the name IDRCloud and press Finish. Now that our web-service is up and running we can alter the code so it can be used with our JavaFX CloudGUI class. We will add some setters so we can set the username, password and other information from what the user enters into our GUI. Replace the IDRCloud class code in our IDE with the one I’ve uploaded here. Our IDRCloud class is now setup and it will handle all the file and information handling for our cloud converter. The next step is to tie our IDRCloud class to our CloudGUI class. Todo this we will create an IDRCloud object in the CloudGUI class. * Finalise Containers and Stage. By instantiating our IDRCloud class, we will have access to all the methods in IDRCloud and it will enable us to begin the connection to our Web Service. All future code will go after our converter object and before our finalisation of the containers and stage. We now have a way to connect to our web service from our JavaFX GUI. So now we know how todo this and how to access the methods, we can can go ahead and code in the GUI Front-End for our Web Service. The order we’ll code our GUI is as follows. First we’ll code in the username and password text-fields. 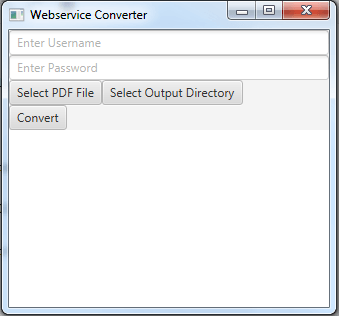 Then we’ll add our three buttons to select a PDF, Output Directory and a button to begin the conversion. Then we’ll code in our WebView object which will display the converted content after the conversion has finished. Lastly we’ll code in the File and Document chooser along with the Buttons Listeners. Coding in the Username and Password Text Fields. First let’s code in our User Name and Password text fields, this will be an area where the user can enter the email address they used to sign up to our web-service. Coding in the Select File, Output Directory and Convert Buttons. Secondly, we’ll code in our buttons, the Select File and Select Output buttons will be placed inside a HBox container which will make them display horizontally. Coding in the WebView Object and our File/Directory Choosers. Thirdly, we need to add a WebView which will allow us to view our converted content after the conversion process has finished and the files have been sent to our output directory. And we will also need to add a couple of Choosers which will allows us to select a PDF file for conversion and an output directory for the converted files to be sent to. Coding in the Action Listeners. We need to add some listeners which can be tied to our interactive objects, these listeners will collect the information from the GUI that the user has entered, e.g username, password, pdf file and the output directory. This information will then be sent to our IDRCloud Object and will be used to connect to our Web Service and begin the Cloud Conversion. Finally, Give it a Whirl! We now have an interactive GUI where you can pass in the username and password you created when signing up to the webservice, if you missed signing up then click here to signup. 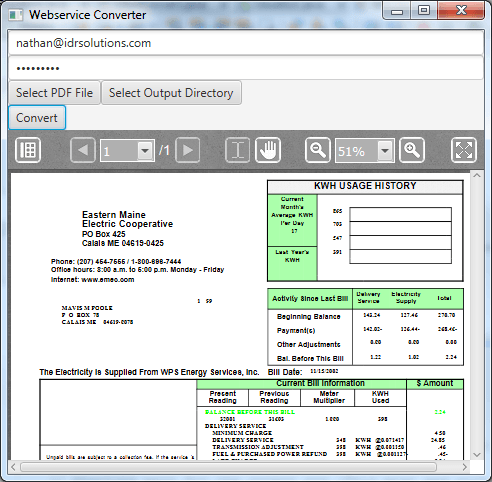 You can select a PDF file to convert and an output directory for the HTML to be placed after conversion, your converted content will then be displayed in the web view object that we created. Thank you for reading this tutorial, I hope you enjoyed it and I hope you now understand how a JavaFX GUI can interact with a web-service. If you have any difficulties or questions then please post in the comments bellow. Thank you.